Water’s at a premium in van life boondocking. That’s why Vanholio dry shaves in the field. Plus it beats playin' with water on a cold mornin'! But it ain’t harsh like it sounds. Let me tell ya how this works. That's my van life secret to dry shavin' – aloe vera gel. You could use just about any kinda lotion, but I like the aloe vera. That's because it don't plug up the pores, ya can get it without scents, and it moisturizes and relieves scrapes. Oh, and it’s great to have around if you get sunburn or windburn. The aloe vera gel, or whatever other lotion, goops up in the razor. And ya ain't got no runnin' hot water ta flush it out! Your fancy 4 and 5-blade razors're gonna be useless. Good news is that single-blade disposable razors is cheap, ‘specially at Walmart! 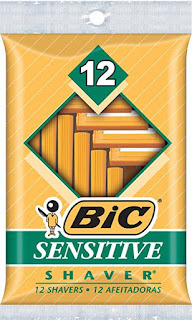 I like the BIC Sensitive Shaver 12 pack. Usually get 4 or so shaves per razor. If ya wanna, you could likely save more money with an old-fashioned safety razor. The aloe vera gel don't stick around too bad. You can wipe it off easy with a paper towel, napkin, towel, or dirty t-shirt. The cut hairs come off with the excess gel. And your face feels nice clean and soft afterwards. If the razor ain't shot, you'll wanna clean it up for reuse. I can usually wipe out the gel OK with a paper towel and a toothbrush. Sometimes I'll soak the blade in 1/4 C of water to soften the gel, if I've let it dry up. Alternatives Van Life Shaving Methods? Obviously, you can use an electric razor dry. And some vandwellers don't mind using a little bowl of water, whatever Vanholio says. Another thing I do is just wait till I'm at a restroom. I done shaved in many a gas station, Walmart, and grocery store. I just use the hand soap for lotion. Don't feel self-conscious 'bout shavin’ at such places no more. Not Dry Shaving, But Check Out These Videos! I strop my razor as needed on my outstretched palm (living leather) and get many weeks of usage. I'm lazy and use BICs. 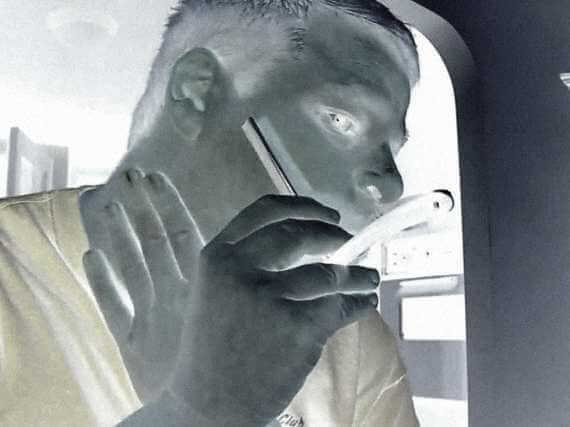 But if and when I get a real straight razor, I'll keep your method in mind.